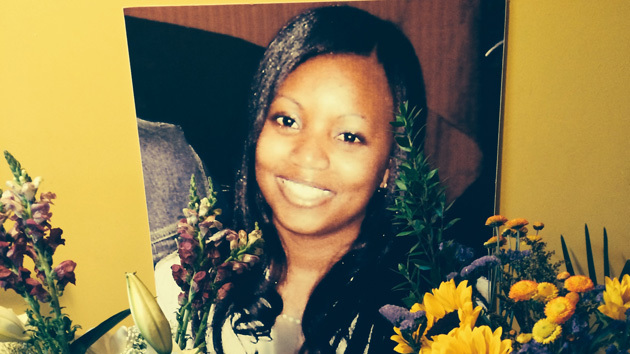 Miriam Carey died in a hail of bullets, her infant in the back seat. Was a Secret Service screwup to blame? At 2:13 p.m. on October 3, 2013—10 months before Michael Brown was killed in Ferguson, Missouri, nine months before Eric Garner was choked in Staten Island—a 34-year-old African American woman drove into a checkpoint in Washington, DC. Her car, a Nissan Infiniti, had Connecticut license plates; her one-year-old daughter sat in the back. Maybe the driver knew this checkpoint leads to the White House. Or maybe not. She did soon appear to realize, however, that she was somewhere that she did not belong: Secret Service officers began hollering at her—”Whoa! Whoa!”—and she turned her car around. 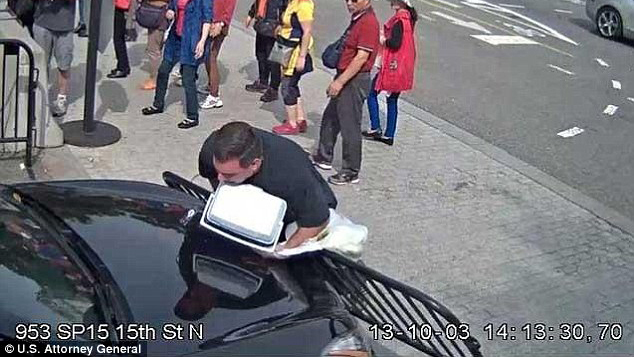 When she attempted to drive out of the checkpoint area, an off-duty Secret Service officer placed a section of metal fencing in front of her, even as he held on to what appeared to be a cooler and a plastic bag. She pressed on the gas, knocking the officer and barricade to the ground, and zoomed down Pennsylvania Avenue. She stopped next to a curb, and six officers on foot surrounded her Infiniti. Guns drawn, they yanked on the doors, demanding she step out. Instead, she put the car in reverse, slammed into a police cruiser behind her, then lurched forward onto a sidewalk, forcing officers to scatter. Three officers—two from the Secret Service, one from the Capitol Police—fired eight rounds at her. But she kept going, careening down First Street NW, turning right on Constitution Avenue, police cruisers tailing her, lights spinning and sirens screaming. Soon she encountered a raised barrier. With nowhere else to go, she pulled the steering wheel to the left, rode onto a grassy median, and plowed into a parked car. Then she shifted into reverse, forcing a Capitol police officer to dart out of the way. That officer and a Secret Service officer each fired nine rounds at the Infiniti. Finally the vehicle stopped, its tires atop the median. The driver was taken to a hospital; her baby was somehow unharmed. Only seven minutes had elapsed from the moment the car chase began until it ended, and throughout the rest of the day, CNN broadcast footage of it over and over. Within hours, the whole country knew the driver’s name. Hundreds of law enforcement officers raced to her condo in Connecticut, with hazmat suits, bomb-sniffing dogs, body armor, assault weapons, and a bomb-detecting robot. Reports of “shots fired” had sent Capitol Hill into a frenzy, sparking a temporary lockdown, and terrifying politicians and staffers alike. At 4:38 p.m., Maryland Rep. Steny Hoyer, the House Minority Whip, stood up on the floor of the House to express “our gratitude to the Capitol Police.” Members of Congress rose from their seats to applaud, giving the officers a 35-second standing ovation. Ninety minutes earlier, at a hospital nearby, a doctor had declared the Infiniti’s driver dead. At first, October 3, 2013, looked like it was going to be a slow-news day. Senate and House leaders were still bickering about who was to blame for the government shutdown, now three days old. Samantha Power, then the newly appointed ambassador to the United Nations, appeared on the Today Show to talk about, as the tagline read, “balancing diplomats and diapers.” The trial of a lawsuit brought by Michael Jackson’s family had just ended, with a jury deciding that the concert promoter (which had hired Dr. Conrad Murray) was not responsible for the singer’s death. And then, at 2:30 p.m., a story pushed the cable TV networks into overdrive. Soon one CNN correspondent after another filled the screen. “This is early information. As we know, sometimes early information is not correct,” Jake Tapper said, then reported that “gunfire was exchanged.” In fact, no gunfire was exchanged; the Infiniti driver did not have a gun. Tapper also said that “one officer was injured at the Capitol.” This was true: A Capitol Police officer had been injured, though not by gunshots or because he was hit by a car; rather, he had driven into a concrete barrier during the chase and crumpled his own cruiser. Carey did not try to “ram” through any White House gate or White House barrier. The only barrier she banged into was the metal barricade that an off-duty Secret Service officer placed in front of her car—not to stop her from getting close to the White House, but to prevent her from leaving the checkpoint area. That’s how she found out that her sister Miriam, a dental hygienist and mother of one, had been in a car chase near the Capitol. Staring at the screen, Valarie, who’s a former NYPD police officer, thought the car looked like her sister’s. The baby who’d been removed from the backseat had her face blurred to conceal her identity, but Valarie saw enough to think the girl resembled her niece. What was going on? The whole thing made zero sense: Her sister and niece lived in Stamford, Connecticut. What were they doing in DC? “I can’t talk to you right now,” she told the reporter, and hung up. As she flipped back and forth between stations, trying to get more information, her phone kept buzzing. “Call me. 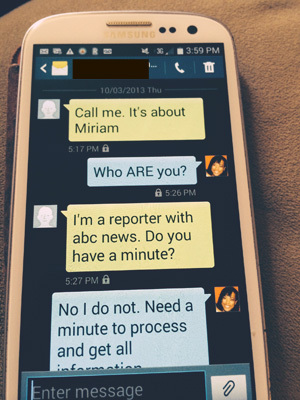 It’s about Miriam,” somebody texted her at 5:17 p.m.
“Who ARE you?” she wrote back. At 6 p.m., in Washington, DC, Cathy Lanier, the chief of the DC police, held a press conference. When asked the name of the woman driving the Infiniti, she refused to reveal it. (“We would make next-of-kin notification before we released that information,” she said.) 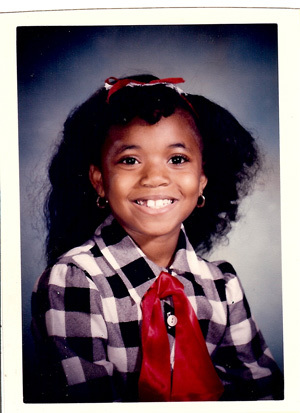 By then, however, Valarie’s cellphone was already blowing up. Throughout the evening, reporters kept texting her, trying to confirm that the driver of the Infiniti was definitely her sister. Reporters had good reason to be extra cautious about publicly identifying the driver. Two weeks earlier, CBS and NBC had mistakenly named the wrong guy on Twitter as the mass murderer in the Navy Yard shootings. From what Valarie could see on the television, switching from station to station, it seemed her sister was dead. But how could she be sure? No law enforcement official had called to notify her of her sister’s death—or to tell her anything at all. The Pink Houses—a housing project in one of the poorest parts of Brooklyn—popped up in the news last November after an NYPD officer killed a young man there by firing his gun inside a darkened stairwell. 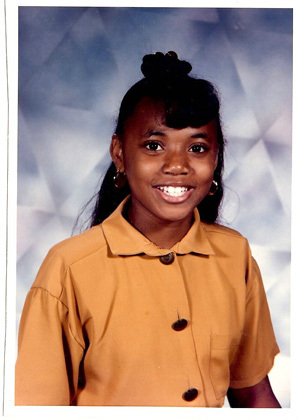 Three decades earlier, the Pink Houses were Miriam Carey’s home. Her mother, Idella, raised five daughters there; Miriam was the fourth. After high school, Miriam enrolled in a dental-hygienist program at a community college in the Bronx, then went on to Brooklyn College. Photos from the early 2000s show Miriam with her older sisters Amy and Valarie, now all adults, out together at night, each wearing a stylish outfit and radiant grin. In the hours after her death, reporters raced to uncover every detail about Miriam’s life, tracking down relatives, friends, neighbors, acquaintances, former employers, neighbors of her sister, neighbors of her mother, a neighbor of her boyfriend. The public learned all sorts of details, relevant or not: The tires on her Infiniti had been stolen several months earlier; she had once been fired from a dental-hygienist job; her condo had cost almost $250,000; discharge papers from a 2012 mental-health evaluation were found in her home. The same questions hung over every news story: Why had she driven with her baby to DC? And why had she turned into a checkpoint that leads to the White House? Had she been trying to target the president? The day after her death, her sister Amy told reporters that Miriam had been diagnosed with “postpartum depression with psychosis” after the birth of her daughter. This condition is extremely rare, affecting only 1 or 2 out of every 1,000 women who give birth, and it’s considered temporary as long as it’s treated. Symptoms include delusions, paranoia, hyperactivity, hallucinations. Miriam had been “very compliant with her medication,” her sister Amy said; she had “worked very closely with her doctor to taper off” and was not “walking around with delusions.” Indeed, one day before the car chase, she had gone to her job at a dental office and seemed fine. Whether or not she was delusional when she drove to DC, nobody seemed to know for certain. Her sister Amy told reporters that Miriam had been diagnosed with “postpartum depression with psychosis.” One day before the car chase, she had gone to her job at a dental office and seemed fine. Whether or not she was delusional when she drove to DC, nobody seemed to know for certain. The only problem with these stories was that they weren’t quite true: Carey did not try to “ram” through any White House gate or White House barrier. The only barrier she banged into was the metal barricade that an off-duty Secret Service officer placed in front of her car—not to stop her from getting close to the White House, but to prevent her from leaving the checkpoint area. This distinction did not get made in the mainstream media, however, before most reporters had moved on. And her case didn’t receive scrutiny even after the Secret Service found itself embroiled in scandal last fall. (An exception was this fine piece by the Washington Post’s David Montgomery.) Nor did it receive much attention yesterday, when it was revealed that on March 4th two Secret Service agents drove their own government-issued car into a White House barricade allegedly after a night of drinking. 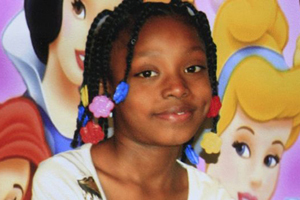 Also Read: What Killed Aiyana Stanley-Jones? After Miriam’s death, the progressive voices one might have expected to take up her cause—Al Sharpton, the NAACP, the Congressional Black Caucus—remained silent. And in a strange reversal, media outlets on the opposite end of the political spectrum embraced her: conservative, libertarian, conspiracy-minded. Alex Jones’s rage in the hours after her shooting was shared by the American Spectator, which soon ran a piece with the headline: “Why Is This Not a National Tragedy? A troubled young mother is shot dead and our ruling class applauds.” The media outlet that pursued Miriam’s story with the most zeal was WorldNetDaily (WND), a conservative news site, which published more than 50 pieces about her. One afternoon last August, Miriam’s mother and sisters Valarie and Amy gathered in Valarie’s apartment, and they invited me to join them. Ten months had passed since Miriam’s death; in Valarie’s foyer, a shrine to Miriam greeted visitors with the smell of lilies. I sat down in the living room, where a framed portrait of President Obama hung near the entrance to the kitchen. Soon the family’s lawyer, Eric Sanders, a former NYPD officer and Valarie’s friend, showed up too. (Sanders has filed a claim—the precursor to a lawsuit—on the family’s behalf against the federal government, the Secret Service, and the Capitol Police.) Valarie offered glasses of ginger ale and set out some mixed nuts. The mood was friendly, but wary too; the family did not seem especially eager to talk to another reporter, but they did have a few things they wanted to say. Read the Carey family’s legal claim. 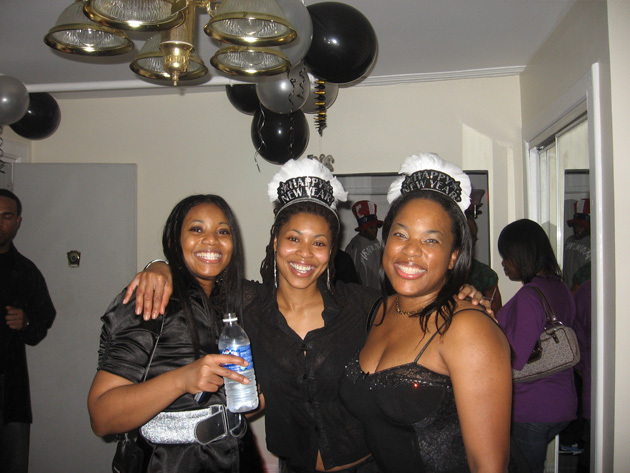 Read Miriam Carey’s autopsy report. As devastating as Miriam’s death had been, in some ways the months that followed were even more upsetting. The family says it never received official notification of her death. No letter explaining what happened, no condolence note from any elected official in Washington. When Miriam’s autopsy report was made public last April, her family learned that she had been shot once in the arm, once in the head, and three times in the back. Of all the Carey family members, Valarie spends the most time on the internet, tracking everything that anyone is saying about her sister. In the days after Miriam’s death, Valarie says, strangers sent her messages through Facebook and Twitter along the lines of: “I have information about your sister. She was being mind-controlled. I’m being mind-controlled, too.” One woman in California even emailed a packet of mind-control information to the family, addressed to the funeral home. When I ask to see it, Valarie disappears into the back of her apartment, then returns with a thick envelope. In the months that followed, when protesters took to the streets to rally on behalf of people killed by the police—Eric Garner and Michael Brown and others—Miriam’s name did not show up on their posters. On the first anniversary of Miriam’s death—on an unusually warm afternoon this past autumn—a charter bus traveled from Brooklyn to Washington, DC, arriving at Garfield Circle at 1:30 p.m. Miriam’s mother, two sisters, and a slew of friends, relatives, and supporters exited. 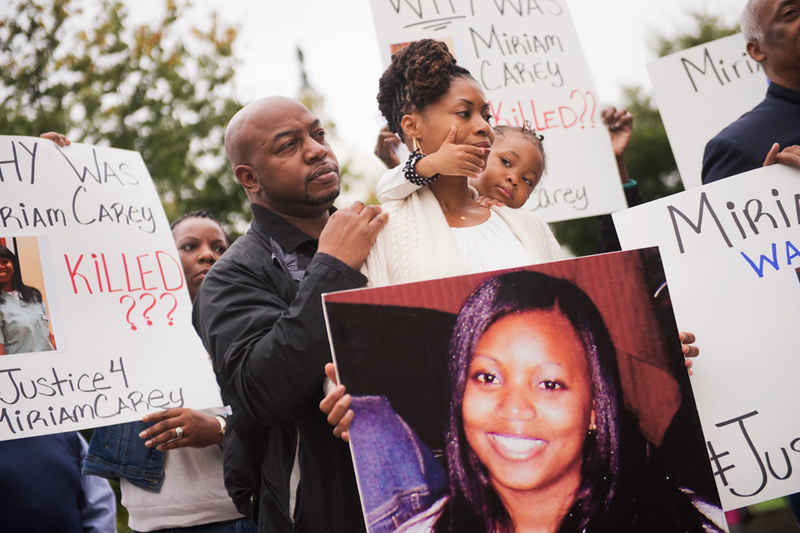 They walked toward the US Capitol, each holding up a poster with a picture of Miriam and a message: “Miriam Carey Mattered” or “Why was Miriam Carey Killed?? ?” For the next 30 minutes, they held a “silent protest” on the steps of the Capitol, then chanted Miriam’s name five times, once for each bullet that hit her. 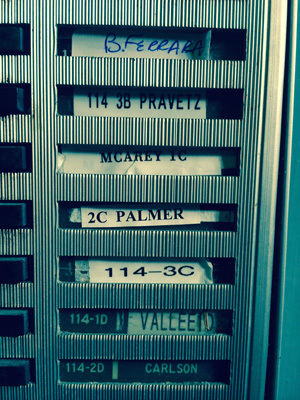 Miriam’s name on the buzzer at the Stamford condo where she lived. Afterward, everyone walked the route that Miriam had driven, beginning on the sidewalk here, where officers had first discharged their weapons at her. The family’s attorney led the way down 1st Street SW and along Constitution Avenue before stopping near 2nd Street SE. “This is where the last shots were fired at Miriam,” he says, pointing toward the middle of the street. “This is where she died.” Everyone turned to study the strip of grass in the center of the road, not far from a sign directing drivers to I-95. There was nothing to mark the spot, nothing that made this median seem any different from any other one in America. In the months that followed, when protesters took to the streets to rally on behalf of people killed by the police—Eric Garner and Michael Brown and others—Miriam’s name did not show up on their posters. There was, however, one place where her name did still appear. Inside the entryway to the building in Stamford where she last lived, next to a row of buzzers, one name-label still read: “MCarey 1C.” A year after her death, her condo appeared unoccupied, and the shades remained closed. Her daughter, now two years old, had moved in with her father. And Miriam’s bullet-marked body lay buried at a cemetery on Long Island, sealed inside an orchid-gray steel casket. 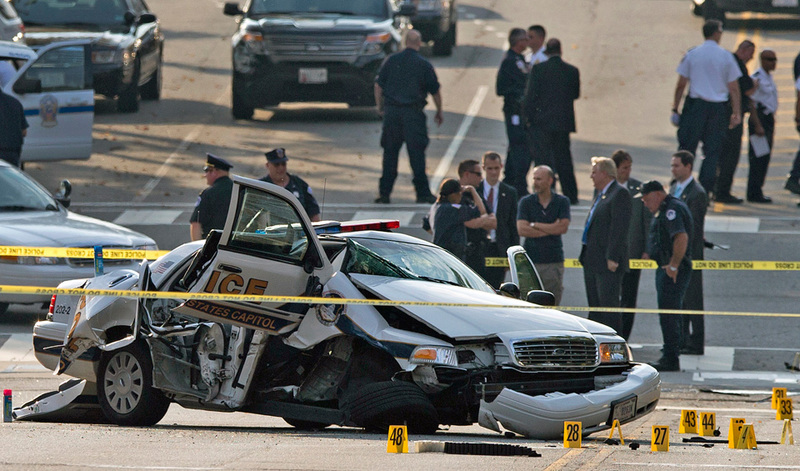 Correction: A previous caption for this image misstated that the damage to the police car was inflicted by Miriam Carey’s car. The damage was in fact the result of a separate collision.